With a modern look and strong design, this vanity will help any bathroom look nicer. With a white acrylic counter and off-white mdf base, this piece is very stylish. Keep many bathroom items in its roomy drawers and double-door cabinet. Redo the style of your bathroom with this classic from Cutler Kitchen Bath. Enjoy the popular modern look in your bathroom with this beautiful vanity. The white acrylic counter and grey mdf base make a beautiful look in your bathroom. Keep many bathroom items in its roomy drawers and double-door cabinet. Make your bathroom look like new with this good-looking, useful set from Cutler Kitchen Bath. 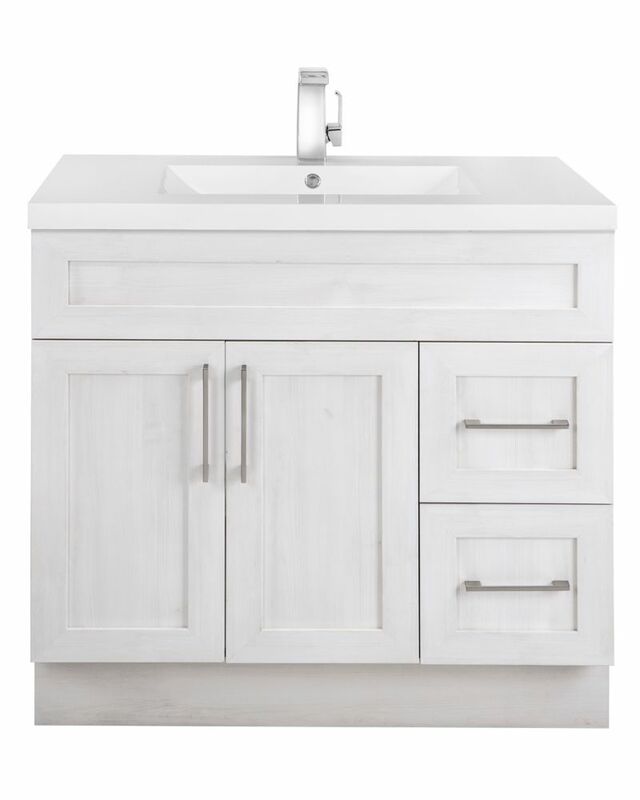 Fogo Harbour 36-inch W 2-Drawer 2-Door Freestanding Vanity in Off-White With Acrylic Top in White With a modern look and strong design, this vanity will help any bathroom look nicer. With a white acrylic counter and off-white mdf base, this piece is very stylish. Keep many bathroom items in its roomy drawers and double-door cabinet. Redo the style of your bathroom with this classic from Cutler Kitchen Bath. Fogo Harbour 36-inch W 2-Drawer 2-Door Freestanding Vanity in Off-White With Acrylic Top in White is rated 4.0 out of 5 by 1. Rated 4 out of 5 by JunieMoon39 from OK product, not described fully Height was not in description, item was kitchen height sold as bathroom vanity, had to have 3” cut off. Quality as advertised. When unpacked, found to have small gouge in acrylic edge, needed repair.